Granite Rock RV Park is brand new and located in Kingsland, Texas in the Texas Hill Country, just a short distance from the confluence of the Llano and Colorado rivers which form Lake LBJ. Enjoy an abundance of water activities including boating, water skiing, swimming, fishing and local festivals like the Kingsland Aqua Boom festival on July 4th and the Marble Falls boat races in August. Also, dont miss the Crawfish Festival in Llano and the Bluebonnet Festival in Burnet, both in April each year. Visit Enchanted Rock, Longhorn Caverns and Inks Lake State Park and check out the Bald Eagles nest located on St Hwy 29 between Buchanan Dam and Llano. This is a hunting and fishing paradise and everyone loves the wild flowers, especially the bluebonnets in the spring. Be sure to shop our unique Hills Country Towns, including Burnet, Marble Falls, Llano, Kingsland and of course Fredericksburg, which is within an hours drive. And dont forget the antiques, this is indeed an antique shoppers paradise as well. Amenities: Free Wi-Fi, Big Rig Friendly & Spacious Pull Throughs, Concrete patios at each site complete with metal chairs & table, Laundry Room, 3-way Full Hookups, 20/30/50 amp, Large Clubhouse with large TV, Wii and relaxation area, Full Kitchen with Granite Counter Tops, Fur-Kid (Pet) Friendly, Kingsland Community Park is a few yards away with boat launch, swimming area, fishing & picnic area on the shores of Lake LBJ, Access to boat slips and day slips for your boat, Hiking trails and Golfing is close by too. Daily, Weekly and Monthly Rates. Amenities: Constant Level Lake LBJ Waterfront, Lake Swimming, Private Launch & Boat Slips Lighted Fishing Dock (Covered) with Bait, Swimming pool, Miniature Golf Course, Arcade & Wireless Internet, Volleyball, Washers, Horseshoes, Basketball, Shuffleboard, Picnic Tables, Benches, Grills & More. Our facilities are located near major attractions such as The Vanishing Texas River Cruise, Long Horn Caverns, Inks Lake State Park, Enchanted Rock, area golf courses, and unique Hill Country Towns such as Kingsland, Burnet, Llano, Buchanan Dam, Tow and Marble Falls. Our facilities are affordable and perfect for family reunions and corporate outings. Make you reservations right away. 830-265-7587 Deer Capital Of Texas - Llano Hill Country - whitetail deer, ,javenlina and turkey hunts on 300 acres. campsites available, guided tours, transportation to and from blinds, game management. Amenities: A tree covered 6 acre peninsula with 2,000 feet of waterfront on the NW side of Lake Buchanan. 5 cabins, RV sites, camping, reunion hall, boat ramp and boat slips. A good place to access the waterfalls and upper river. Reveille Peak Ranch is the Texas Hill Country at it's best, combining the love for the land with the spirit of adventure. This 1,300- acre outdoor event ranch & adventure and education center, is just outside the Burnet in the Highland Lakes area, and less than an hour from Austin. Whether you're looking for some of the best mountain biking, trail running,, fitness training, exciting outdoor recreation, SCUBA diving, camping and RV park, or a full-service venue to host an event for dozens or thousands, Reveille Peak Ranch provides an experience like no other in Texas. 325-247-2152 Our 20 acre park is located on the beautiful Llano River just ½ mile from the Llano Golf Course. Be sure to check out our golf packages. Stroll Roadrunner Trail and enjoy nature at its best, go fishing or take a swim in the crystal clear Llano River. We are only 1 mile from the Llano Town Square where youll find unique shops, great food and a beautiful Historic Courthouse. 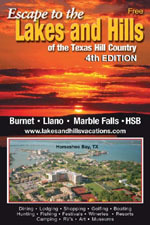 Enjoy Llano, a truly unique Hill Country Town. Amenities: Full Hookups, Free Wireless Internet, Cable TV, Pull Thru Sites, Big Rig Friendly, Walking Trail, Swimming, Fishing, Riverfront Access, and Picnic Area.